Oscar season rolls on with what was my sixth most anticipated movie for the whole of 2016, Creed. A new chapter in the Rocky franchise, this time Rocky not being the main focus. Oscar nominated Sylvester Stallone unwillingly at first trains his late friend Apollo Creed's son Adonis to become a great in boxing. With six films already in the franchise, would Creed be able to stand proudly next to its predecessors or would it be a bad step in what has been a very credible franchise? Creed stars Michael B Jordan as Adonis "Donnie" Creed, the son of deceased legendary boxer Apollo Creed- a character in the previous Rocky movies. A tough up bringing caused Creed to be fighting for most of his life. Fast forward to seeing Creed as a young man, he grows tired of working in his office job and packs up his bags to move to Philadelphia to pursue a boxing career. He seeks out the help of the legend Rocky Balboa (Sylvester Stallone) a past opponent and friend of his fathers. 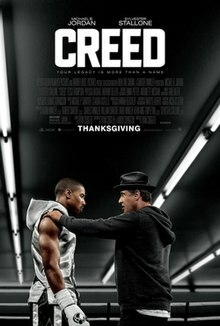 Creed looks to break through without the name of his father hovering over him and wants to prove that he is the real deal. Going into this I had very high expectations. I am a big fan of the Rocky films and as soon as this was announced, I was so excited for it. The first Rocky is an absolute excellent film where Sylvester Stallone was very unlucky to not scoop the Oscar for it in 1977 although it did win Best Picture. The rest of the franchise became more of an entertainment film but do incredibly well at that with Rocky IV being one of my favourite movies of all time. The Rocky movies are full of great enjoyment for all types of movie fans. There is great drama. There are laughs. There are many emotional moments. There is so much inspiration within these movies. So for a movie to become the seventh in a franchise, it may be hard for it to continue this at such a high standard made by the previous films. I am very glad to say that Creed most definitely reached those very high expectations. For a film that is the seventh in a franchise and also another Boxing film that have been done a million times, Creed has still managed to bring new ideas to the table. The idea of having Adonis Creed starting having everything he could want apart from the career is a good take on this film. Showing that he is willing to give up a good well paid job, fancy home and cars to chase his dream is a fairly fresh take on the genre. Also by having to deal with having such a legendary figure being his father is also a great take as it reflects a lot in sport as sons with famous fathers are always compared to them. Very good to see this brought onto the big screen and done so incredibly well. In a genre like this, obviously there is a formula that will most likely be followed. This is why it is important to bring fresher ideas to be able to stand out from the rest and I feel like Creed did this. Michael B Jordan is the star of this film as Adonis Creed and this is a truly great performance. This is a definite Oscar snub as it was truly deserving of being up for the Best Actor award. Not only the physical aspects that he had to go through including actually having to be hit many times, he performs the drama very well. Like most actors in boxing films, they do have to transform there bodies to get in shape and look the real deal. Also with it being reported that Jordan was actually hit many a time for real in this is impressive. When you consider that the actor he was paired up against in the final bout was a real legitimate boxer, it makes it even more impressive. I don't feel that the physical aspects that you go through alone should guarantee you an Oscar nomination. It's just an added bonus for Jordan as he was great in all the dramatic scenes, showing great range throughout the whole movie. When he needs to show the struggle that he goes through either sad or happy, he nails it. With this performance Michael B Jordan has only confirmed more to why he is one of Hollywood's brightest new stars. Unlike Jordan, Sylvester Stallone was nominated for an Oscar, this time being for Best Supporting Actor. Stallone was returning as his most famous character Rocky Balboa but this was the first time he was appearing as a completely finished boxer. In other franchises, continuing with a character when they have aged on hasn't worked and has just damaged the character- see Die Hard or The Terminator franchises. However in Creed, Stallone builds on the character of Rocky Balboa and produces another excellent performance. We see the character like never before as he is now alone and has lost his passion for the craft he mastered and made his living out of. A well deserved Oscar nomination for Stallone in which is a performance that is one of his best. Stick to this Sly instead of Expendables sequels please! There was also a strong performance from Tessa Thompson who plays Creed's eventual love interest and singer Bianca. She plays a very strong character who grows very close to both Adonis Creed and Rocky Balboa as they progress with their training. Thompson can probably feel hard done by to have missed out on a Best Supporting Actress nomination as she plays a very supportive and strong individual character. The action and story will compel you so much that there were actually people in my screening cheering and clapping at what was happening on the screen. You will certainly be feeling something inside your gut during this film that will make you psyched and pumped up. From the training to the final fight there are a lot of moments that will get you at the edge of your seat and make you forget you are really just watching a movie. I really feel that Creed is a very special movie. On a few occasions the film was able to make the hair on my arms stand up showing how this film gripped me. For a film to do this once makes it special never mind doing so more than once. For me, this separates a good sports film to a great sports film. If there's a moment that grabs you and makes you feel like you are right there, feeling the emotion in that specific scene it can really lift the whole movie up. Once again the footage of the actual boxing in this is absolutely phenomenal. The fights look so brutal and realistic which it needs to be or it doesn't look good at all. The first boxing match that we see is filmed beautifully. There is a long continuous shot to show the whole fight in one take and it follows the action incredibly. Such a beautiful shot even though what is going on inside the ring isn't beautiful for the competitors. Like any franchise of course there is going to be some nostalgia appearing in the film. From the classic stars and stripes shorts to chasing the chickens, there are many things reappearing from the past. I would say that most of the blasts from the pasts are done right. There are many things that make sense to why they are brought up as they have something to do with the film. They aren't just thrown in for the sake of it. It would of been so easily for them to just ride off the past and completely overfill everything with nostalgia but I feel they did a great job handling it. I don't really have any complaints for the film. I feel like I'd be really nitpicking by saying I didn't really like anything from this film. Maybe the villains Scouse accent was the worst thing about it. I'm not saying it is perfect but I absolutely loved this film. For fans of the franchise and for newbies, I'm sure yous will all thoroughly enjoy it. I highly recommend this film to everyone. So if you have seen Creed, what did you think? Where does it rank up there amongst the Rocky films? I hope you got as much enjoyment out of this film as I did. Once again thank you for reading my review, it really means a lot!